I read somewhere recently that the quality conscious foodies of the world have now collectively announced Copenhagen old news and are instead hopping on the boat to Bornholm located in the Baltic Sea. Though this might be overstating it, I sort of see why. The Danish island with its fields covered in poppies and corn flowers, colourful little towns, and not to forget: hip and happening restaurants is about as tasty and picturesque as it gets around here during summertime. We spent a spontaneous two-and-a-half day on the island last week as a car was leaving from Copenhagen offering us a ride. Both Esben and myself being self-employed, we brought along our laptops and worked when we had the chance. However, we also did the things that are mandatory for summertime in Denmark: biked around the island and took the bikes on the bus back (it's hilly out there! ), jumped in the sea from the granite cliffs, enjoyed ice cream cones at least once a day, and ran for shelter when the summer rain came. 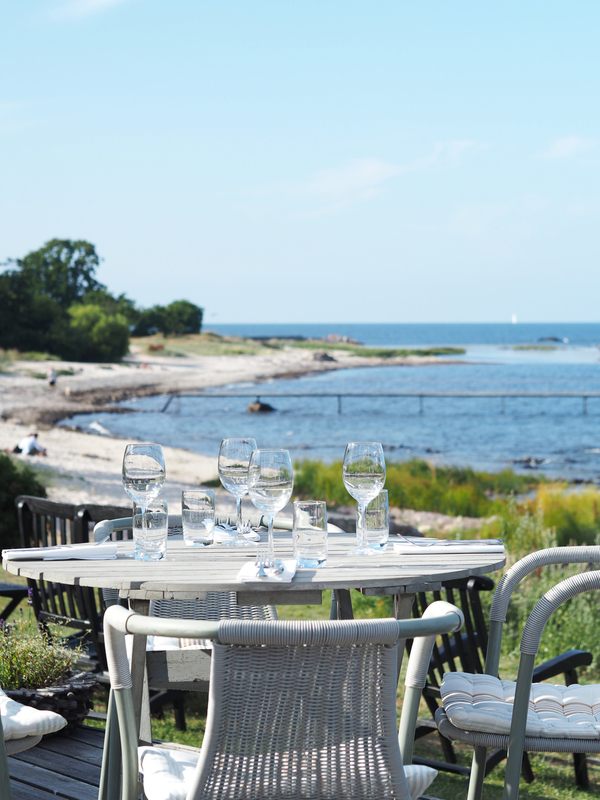 The island of Bornholm is branded as being a foodie's delight, and with a fair amount of restaurants for its size, local chefs take pride in fresh ingredients bred from the warm and somewhat exotic climate compared to the rest of the country. Whilst the Michelin-starred Kadeau is the landmark of the island, there are quite a few great (and more affordable) spots to opt for, one being the seasonal restaurant at the iconic beach hotel Melsted Badehotel (pictured above). The restaurant is run by Frederik Bille Brahe, the chef behind the much hyped café Atelier September in Copenhagen, and their terrace on the beach with the sounds of the ocean was the perfect backdrop for enjoying foraged chanterelles, halibut ceviche and a fresh and fruity tart for dessert. 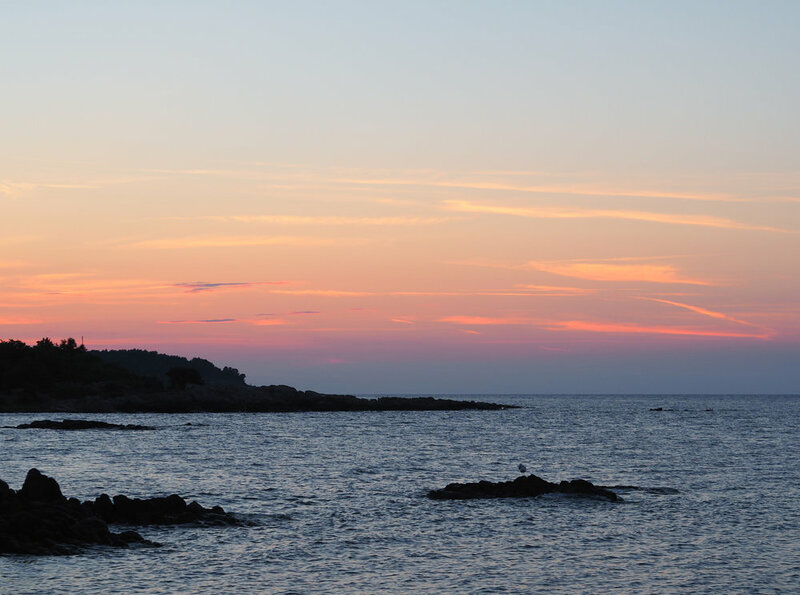 Please scroll down to end of post for a curated guide to Bornholm. During our stay, we visited the towns Allinge, Gudhjem and Svaneke on the eastern coastline. Whether you're getting around by car or bike, the route through these three towns along the coastline is quite spectacular offering nature views unlike anywhere else in Denmark. We stayed at Hotel Grønbech in Allinge, which is a newly renovated hotel with a central location and a nice homely feel (plus, their breakfast rolls were the best—I can never control myself at a buffet, and these home-baked ones didn't make it any easier for me). 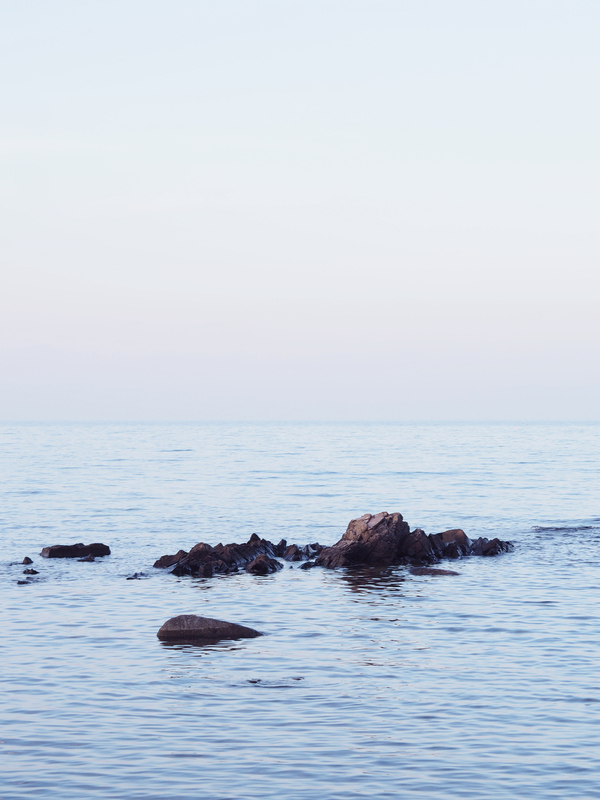 Bornholm was my third visit to Danish islands this summer—as we spent a week on Aeroe and a day on Skaroe in the archipelago of South Funen—and I don't regret for a second that we decided to spend our summer in Scandinavia. Especially since these past few weeks have been warm and sunny with loads swimming both in the sea and the Copenhagen harbor. With a population of about 40,000, Bornholm is much bigger than Aeroe and during the summer season, the island gets quite busy with tourists. However, as with all destinations, the key is to find your own path, and we enjoyed some quiet moments on a small beach that we had to climb cliffs to get to (worth the hassle! ), an early morning on Dueodde beach while everyone else was sleeping, and a sunset from the cliffs north of the Allinge harbour. It's becoming quite the cliché, but there's something special about Danish summers—Bornholm being a first-class example. Kadeau | Seasonal and regional Michelin-food with sea views. Sommerpony | Kadeau's pop up sister restaurant offering a simpler and more affordable menu. Frederik Bille Brahe x Melsted Badehotel | Beautiful dishes from local ingredients at the charming beach hotel. No. 9 | Best restaurant in Allinge with a cosy backyard and a good selection of fish dishes. Kalas-Kalas | Combined ice cream and coffee shop located right on the cliffs by the sea. Svaneke Is | Tasty home made ice cream in Svaneke. Bornholm smoke houses | Visiting a smoke house in one of the island's harbours is a must—order local dish 'Sol over Gudhjem' (smoked herring served on rye bread with a raw egg yolk). It may sound odd, but it's one to try! Hotel Grønbech | Budget-friendly and newly renovated hotel with 29 rooms in the centre of Allinge. Melsted Badehotel | Charming and classic beach hotel with a bright and airy feel. Shop | Pay a visit to ceramics shop Lov i Listed. Music | 'Gæstgiveren' in Allinge presents well-known Danish artists throughout the season.